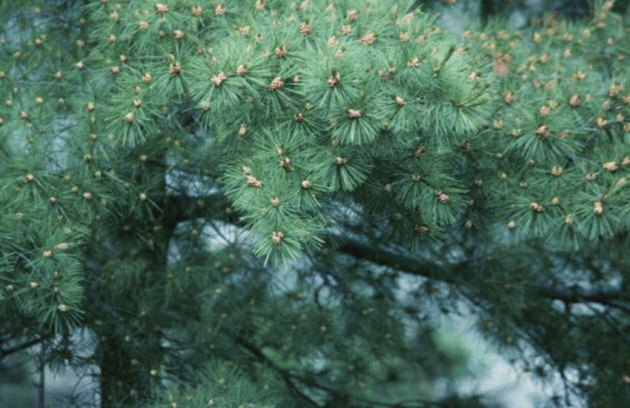 Pine trees are an important environmental asset to wildlife of all kinds, providing habitat and food. Several kinds of birds have the ability to probe or break open pine cones to extract the nutrient-rich seeds. Some birds employ uniquely specialized beak shapes to feed at this bounteous natural table. Pine cone seeds are an especially important food source for several kinds of birds. Pine cones are an abundant food source for wild birds. 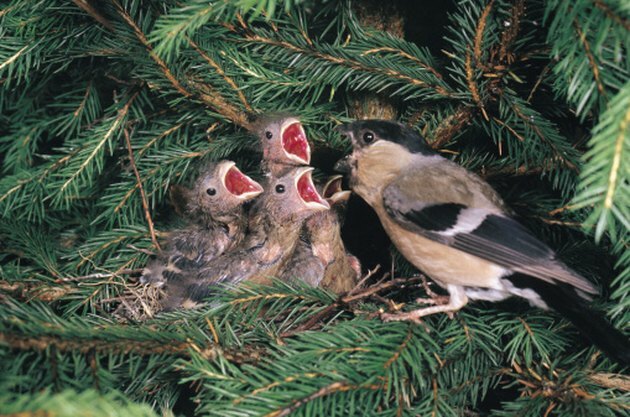 Finches are seed-eating songbirds, several of which eat pine cone seeds. Finches are seed-eating songbirds similar in appearance to cardinals and sparrows. Crossbills are nomadic finches found among conifer forests. The unique beaks of red crossbills and white-winged crossbills move from side to side, holding a pine cone open to enable tongue extraction of the seed. The pine grosbeak is among the largest and rarest of finches with a transcontinental habitat, consuming pine and spruce seeds in a diet largely composed of vegetable matter. The seed-eating pine siskin a common finch, sighted in large flocks among conifer trees. Purple finches, with big beaks and tongues, crack pine cones open to get the seed. Pine cone seeds are an important food source for black-capped chickadees. Chickadees are friendly perching birds with long tails, small round bodies and stubby bills. Chickadees warn each other of predators with alarm calls, to which other birds traveling among them also respond. Black-capped chickadees have round heads large for their bodies. They are curious birds interested in humans, eventually responding to hand-feeding. Eastern white pine cone seeds are favorites of black-capped chickadees. 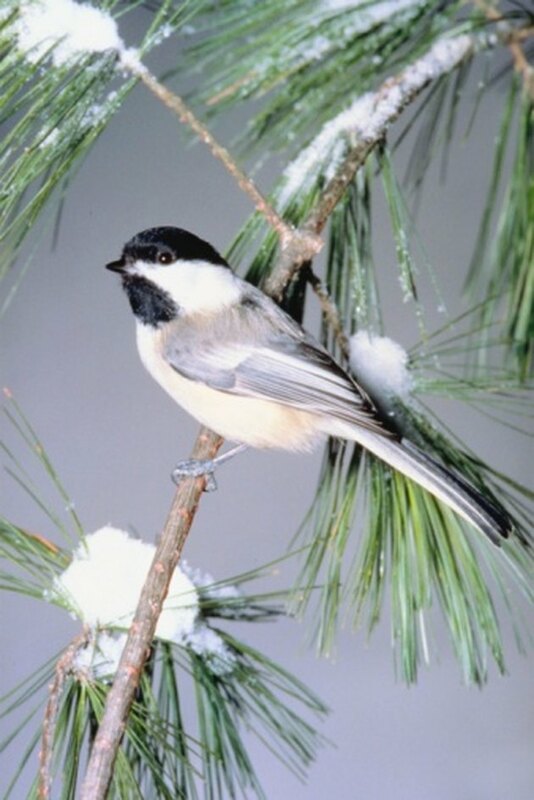 Mountain chickadees are seen hanging from twigs, limbs and pine cones. These social birds flock with several other kinds of birds. Mountain pine cone seeds are an important food source for mountain chickadees. 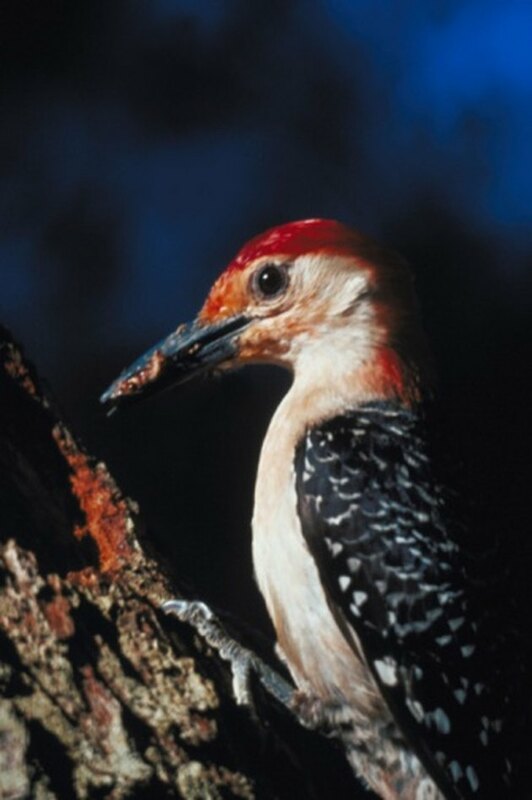 Several kinds of woodpeckers eat pine cone seeds. White-headed woodpeckers are the only North American birds with white heads on black bodies. They extract seeds from unopened pine cones in their western mountain pine forest habitats. Red-bellied woodpeckers live in eastern forests, living on pine cone seeds, acorns, fruits, berries, nuts and occasionally small fish, birds and lizards. Yellow-bellied sapsuckers are woodpeckers that feast on eastern white pine cone seeds. Nuthatches are acrobatic birds, climbing trees head-first, whether going up, down or sidewise. In addition to pine cone seeds, nuthatches probe the bark of tree trunks for insects. 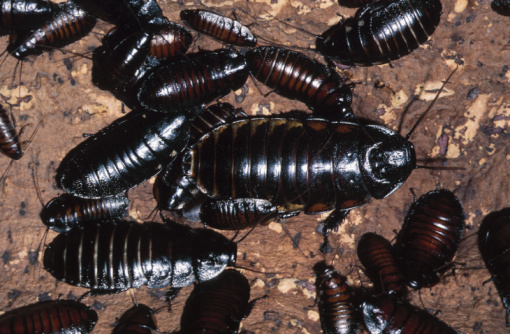 Their interesting name comes from the way that they cram large nuts into tree bark, then hit them with their sharp bills to "hatch" the seed out. They often flock with chickadees and titmice. The brown-headed nuthatch is found almost exclusively in the United States. The white-breasted nuthatch is the largest nuthatch, with attractive gray and white markings. Red-breasted nuthatches are small, colorful birds with a distinctive "yank-yank" call. The little pygmy nuthatch is a social, gray-colored bird. What Birdseed Do You Feed Wrens?